I always see the (inwardly) whenever someone comes back from Delhi and revels in carping about getting around in the Indian capital. The traffic, they report, is a nightmare, and getting from point A to point B is like navigating hell. My frequent — but short — trips to Delhi are geographically constricted: I live in a certain area, and my outings have a radius of three to four kilometres… So I cannot jump to my hometown’s defence as fast as I’d like to. The course of the last fortnight was different. I was in Delhi to attend a long-drawn-out family wedding, and since nobody could be bothered to pull out the red carpet for me (the bride and groom were hogging centrestage), I was pretty much left to my own devices… everyone’s car seemed to be on wedding duty, so I had to fend for myself getting from point A to point B every time I stepped out of the house. And since I was there for a fairly extended period of time, I had to travel long distances in an attempt to catch up with friends and former colleagues in their nesting places. In between, I had to also make a couple of trips to the New Delhi Railway Station — that I’d last been to 15 years ago — to pick up my father (and drop him back), who was coming to town for the wedding from Kolkata and had insisted on taking a train (more comfortable, according to him). The lie of the land that is Delhi had suddenly become a personalised map. By the end of the time I spent there, I was rejuvenated. Physically, because it had been way easier than I thought it would be. Mentally, because I now have solid grounds to defend Delhi. Traffic was no walk in the park, there were some bad snarls especially during peak hours, but I was trying to look at life as a glass half full. What I enjoyed the most was getting back on the ground. For way too long, I’d been told since I’m an “NRI” now, I won’t be able to handle ground realities in Delhi “these days”; I want to say this is the city that’s shaped my thinking and, in many ways, made me what I am, but I’m usually too tired to debate the matter, so I let it be. In many ways, the city has changed — for the better, for the worse — but it still remains the Delhi I so loved and love, the city that taught me tough love. As always, human interactions were the lodestar: from hobnobbing with tea-stall vendors in Chandni Chowk and cops at the railway station to chatting up bookstore owners in south Delhi and restaurant chefs in Khan Market. But it was the drivers — a.k.a. navigators — who made my trip truly memorable. Criss-crossing the vast expanse that the National Capital Region, I rode along with many voices and sensibilities. I was most chuffed that my India rating on a car-riding app was stuck at 5. A friend who was ordering rides for me (when I didn’t have mobile data) from his app told me that his rating had been hiked from 4.52 to 4.86 — thanks to me. “I think it’s a gender thing — men always rate women more favourably,” he complained, but I knew better: I had been having most entertaining conversations with cabbies, and parting as friends. Also, it couldn’t have been a “gender thing” because there was this top-notch woman driver who took me from point A to point B one day. I was trying to, sneakily, take some photos of her (side angles), and then realised I shouldn’t be doing that so manned up sufficiently to ask her if she’d mind posing for a facing-into-the-camera-type photo, and she agreed readily. 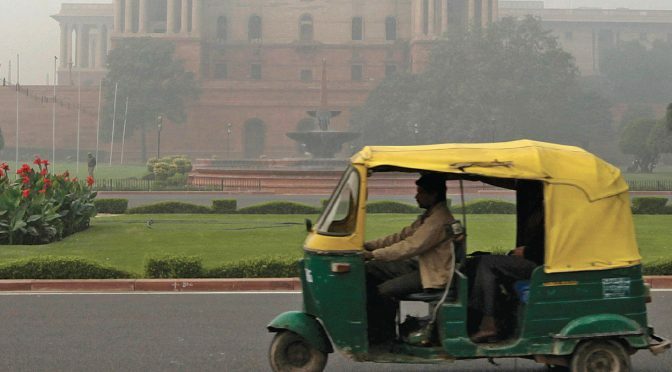 I had numerous occasions to fall back on the trusty centre-of-gravity-defying Delhi autos — again, after ages. Happy to note I was completely at home in them as they did the rough and rumble routine. One evening, we got lost inside the IIT Delhi campus, and with no GPS or Google Maps to guide him, the driver used his smarts to get me to the exact location even as we cracked jokes about the “homogeneity of the campus layout”.